Life is good in Hawaii. The dolphins are fabulous! They love greeting everyone, jumping and spinning for our delight. Bless their hearts! Late spring and early summer brings fewer visitors. There is time to catch up on the life on land. The grass is green, my lime tree had a banner crop, tomatoes in my garden are flourishing, and pineapples are growing. The fish are running and being caught; coffee trees are blooming!Â Dolphin Journeys staff are all happy and doing well. Tiffany & Pluto are happy and still have conversations with the dolphins. This winter – early spring was exciting and very busy at Dolphin Journeys; Valentineâs Day clear through the end of March. We had many days with two boats out, bigger group trips, and one day we had a full dolphin swim trip, a whale watch and a special educational trip up Mauna Kea! Angel Therapy and the Dolphins. We were delighted to have many guests from the Angel Therapy Practitioners training which is being held here this year. Our guests have been from all across the globe: Canada, England, Australia, New Zealand, Iceland, Sweden, Norway, Germany, Italy, Belgium, Serbia, Russia, United Arab Emirates, Indonesia, Japan, Singapore, Chile, Brazilâ¦wow! It really doesnât matter what language the guests speak â the dolphins communicate their joy directly to our hearts! My administrative magician/reservationist, Jeannie, asked the dolphins one day, “What is it about swimming with humans that you like?â The reply: âYou are funny; we enjoy watching you in the water. And we really like receiving your awe and admiration and heartfelt joy after we finish our nightâs work!â So come, laugh with the dolphins! After this very busy period, I am enjoying some time to get caught up on household chores. I went for a spring trip to see my family and attend my college reunion. I was in Minnesota for the last part of May and first week in June. I had the special treat of meeting my newest twin niece and nephew, born this May 15th! Mother and babies are doing fine and well. Parade Float. This past year we have had fun with our Parade Float. Yes, Dolphin Journeys is in the local parades. We took the old boat trailer and built a parade float from wood. My dear friend, Dr. David did the building and Jan Salerno did the painting. Jan was a set builder in Hollywood…so she has amazing talent. In our first ever parade; we placed first in the float contest. We are having lots of fun being in Parades and finding other venues for the float. Volcano Action! Our extraordinary volcano, Kilauea, is very alive and active. I was there leading a tour for a group a few weeks ago. The plumes of gases rising from the caldera and the lava pouring into the sea were spectacular! Yes, we stayed upwind, so as not to breathe the noxious fumes. Vist theÂ Volcanoâs web site for more! I took this photo from about a mile or more away. The lava is flowing into the sea. The weird effects is from the slow exposure and my steady hand or lack there of. There are 3 streams of lava flowing. 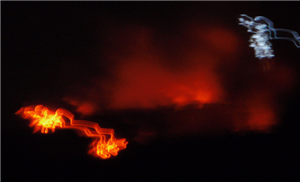 The red glow is the lava on land down in a âpukaâ â just out of sight. The white smoke is anyoneâs guess â¦ Madam Pele, Goddess of the Volcano, showing herself? Remember, Dolphin Journeys has aÂ Volcano tour if you would enjoy a guided trip and visit the special sites and learn more in-depth about the Volcano and the area…. for Dolphin Journeys. Check out the videos! The goal on these pages is to have a forum for Dolphin Journeys guests to share their stories and upload pictures. If you have a great photo or story — please — become a fan of Dolphin Journeys, and share your story with others! I also have aÂ LinkedIn page. My sister Sandy is a wiz at LinkedIn! It is a professional networking site. If you participate at LinkedIn, enjoyed your time with Dolphin Journeys, and want to build your LinkedIn connections – feel free to add me as a connection! I am finding my Macalester College classmates before the reunion, via LinkedIn. So this is how I spend my nights before bed, these days. My web master,Laura Bergells, has been nudging me to be active on these sites for the past year; keeping me âcurrentâ with the trends of web use. Dolphin Journeys is looking forward to a fun summer season. My nephew Bennett will be back this June for a month, to help the crew will all the darling children on the dolphin trips. It is a big help to have the extra swimmer with the kids. Bennett enjoys the boat tours and especially guests his age. We also will have interns this summer, in the fall, and next winter! These college interns are learning the operation of an entrepreneurial guest services company while getting a terrific education in the marine environment. Get Dolphin Gifts. OurÂ Dolphin Gift Shop is where to go if you want to have a mug with your favorite dolphins or pick up a new t-shirt for the summer. There are greeting cards, tote bags, coffee mugs, sweatshirts, a coloring book, and baby items too. All the fabulous journeys we take are thanks to you! We have shared days in the sun, with the crystal clear blue water and the joy of being surrounded by dolphins and whales. The Manta Ray evenings are so magical. We are most honored to be able to fulfill the dreams of a lifetime and revel in the lightness of spirit you experience. Thank you â you make these journeys the special trips that we all enjoy.